← Are Central Valley steelhead really ‘threatened’? 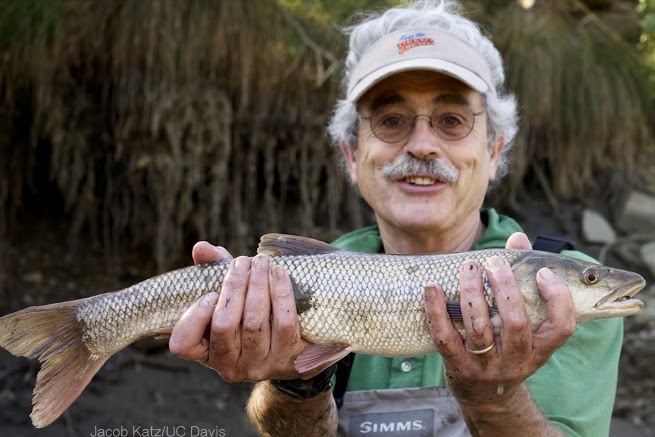 The Endangered Species Act turns 40 this week, and I have been closely involved with the law for as many years as a fish biologist at UC Davis. I arrived on campus in 1972 with the goal of developing a research program on the ecology of California’s highly endemic, but poorly known fish fauna. For better or worse, I found myself involved in endangered species issues from the start. The law has been extraordinarily valuable in promoting studies of endemic species and in keeping them from going extinct. One of my first studies was on the Modoc sucker, a small fish considered endangered and known then to reside only in one small watershed in the Pit River drainage of northeastern California. Much of the species’ presumed habitat was on private land owned by suspicious ranchers. Hiring Alan Marciochi as my research assistant turned out to be a brilliant move. Alan comes from a farming family. He chose to live in the small Modoc County community of Adin for the study. And he played the banjo. Alan and his banjo soon became popular in Adin, reducing suspicions of our motives for finding Modoc suckers. We discovered a couple additional populations and proposed solutions that were relatively easy to implement, such as fencing cattle out of key sections of streams on public land. Because of its limited distribution and small populations, the Modoc sucker will probably never be delisted. But it is unlikely to go extinct as long as its habitats are managed properly. We eventually expanded our survey to include fishes throughout the Pit River drainage, in part to search for the supposedly rare rough sculpin. Our study showed the species to be more abundant and more widely distributed than thought. It lived even in some reservoirs. We also found that management of the region’s spring-fed streams for trout coincidentally protected the sculpin. Both the rough sculpin and Modoc sucker studies showed the value of doing thorough fish surveys in an entire region. Meanwhile, in 1974 and 1975, I had two graduate students, Bill Tippets and Jamie Sturgess, looking for bull trout in a new preserve of The Nature Conservancy on the McCloud River. The McCloud Dam upstream and Shasta Reservoir downstream had greatly altered bull trout habitat, so the once-famous fishery had disappeared. Despite two summers of intensive sampling, they failed to find any. Then, in the fall of 1975, we got word that an angler had caught a bull trout and given it to a fish biologist for the state. We confirmed the catch, and then Jamie interviewed the angler. He fished the same pool with the same lure in the same manner. Amazingly, he caught another bull trout, tagged it and released it. That was the last reported sighting of a bull trout in California. 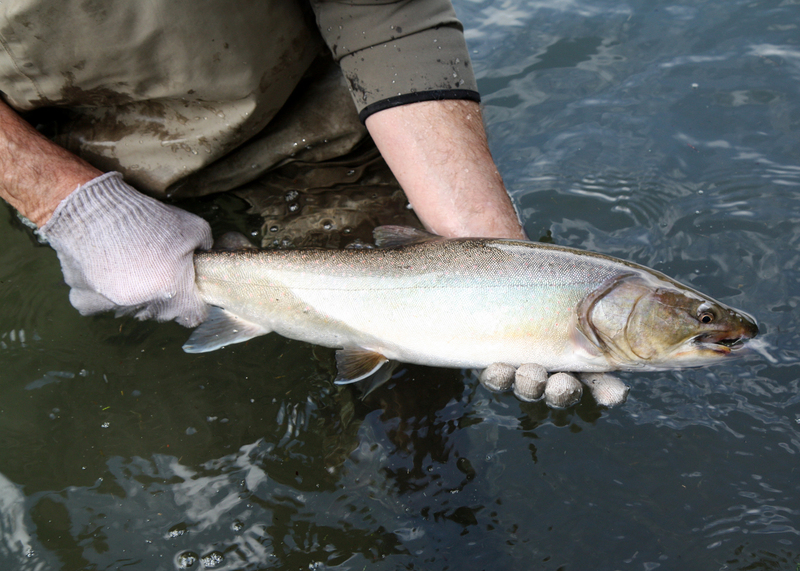 The bull trout is now listed as a threatened species throughout its range in the western United States. But the ESA protection came too late to help the distinctive California population. The studies of Modoc sucker, rough sculpin and bull trout were part of my overall plan to fill the knowledge gaps on California fishes. I discovered some of the blanks in writing my first book, “Inland Fishes of California” (1976). One of the fishes about which virtually nothing was known was the delta smelt. I made my first visit to the Delta in 1972, tagging along on a state Department of Fish and Game mid-water trawl survey. Impressed with the hundreds of smelt being caught, I asked Lee Miller, the biologist in charge, if he could start saving some so I could do a basic life history of the species. A few months later, a truckload of jars full of smelt arrived at my laboratory. In 1979 I began a monthly fish-sampling program on Suisun Marsh, initially to help a graduate student, Don Baltz, collect native tule perch for his dissertation research. Thanks to Randy Brown of state Department of Water Resources, the monthly sampling program became a long-term study of fishes living in the middle of the San Francisco Estuary – research that continues to this day. But in the 1980s, I noticed a dramatic drop in our catch of delta smelt — a decline, I discovered, that was mirrored in other Delta sampling programs. Somewhat naively, in 1988, I petitioned the state Fish and Game Commission to list the smelt as a state threatened species, figuring that a fish found only in California could be best managed by the state. The commission denied my request, claiming they lacked sufficient information to make a decision. But a similar bid by the American Fisheries Society won federal approval for the protective “threatened” status in 1993. 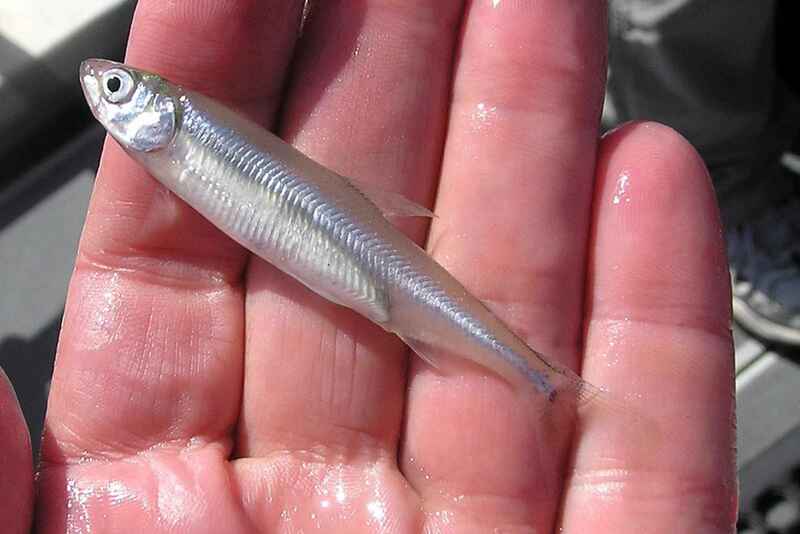 The delta smelt is now one of the best-studied fishes in California. But its populations continue to decline or persist only at very low levels. My 1976 book was the first of four systematic evaluations I did on the status of native California fishes. It found that while there were 9 listed fish species, another 32 could qualify for listing. In 1989, these numbers rose to 13 and 44 species, respectively; in 1995, 16 and 46 species; and in 2010, 24 and 53 species. 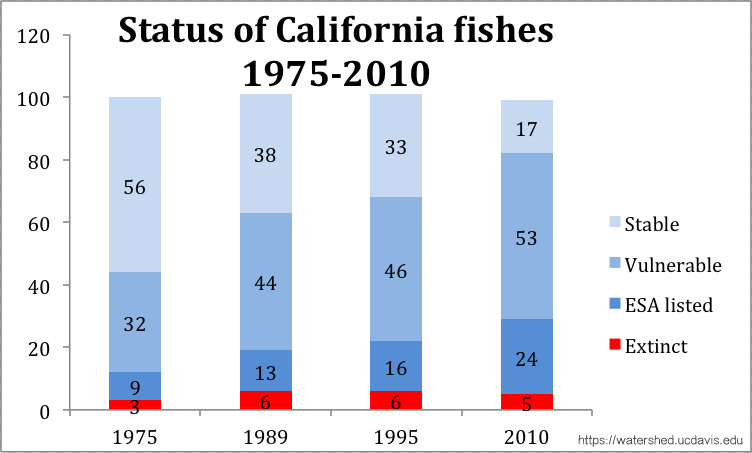 The numbers suggest that the state and federal listing process lags significantly behind the number of California fish species threatened with extinction. Meanwhile, the potential for native fishes going extinct is rising. As my research group recently reported, as many as 82 percent of the 121 native fish species still with us are likely to be gone in a century’s time as climate change accelerates declines of already depleted populations. Native fishes are returning to Putah Creek, the result of changes in the operation of Putah Dam at biologically important times of the year. The recovery shows that it is possible to manage highly altered, dammed streams in ways that benefit native fishes and other biota. California Indian tribes are showing their potential for protecting native fish that are part of their heritage. The Yurok Tribe has established a “salmon sanctuary” on Blue Creek, a tributary to the Klamath. The Susanville Indian Rancheria is working to restore natural spawning runs of Eagle Lake rainbow trout. The Pomo bands around Clear Lake are starting to protect and restore runs of native Clear Lake hitch. The UC Davis Center for Watershed Sciences is developing a statewide management strategy for fishes, starting with database useful for managers who need to know what fish are where. Developed by Joshua Viers of UC Merced and me, the project includes work on dam reoperation and removal and developing recommendations for protecting species and watersheds. The ESA clearly has worked in keeping fish species from going extinct; while many species are endangered, there have been no new extinctions in recent years. We also have the law to thank for greatly increasing our knowledge of declining species, making recovery at least theoretically possible. It has been less successful in promoting recovery of species because of the overwhelming forces of economic development, the demand for water, human population growth and deliberate under-funding of the federal agencies charged with making the ESA work. What’s needed are large-scale efforts that allow the uniquely Californian species to recover and persist in the human-dominated landscape. Perhaps the next 40 years of the Endangered Species Act can reverse the trends seen in the first 40 years, as we figure out how to better live with our native biota. Peter Moyle is a professor of fish biology and associate director of the Center for Watershed Sciences at UC Davis. This entry was posted in Uncategorized and tagged Delta smelt, Endangered Species Act, Modoc sucker, native fish, Peter Moyle. Bookmark the permalink. Doctor Moyle: the best professor I ever worked with. and no slouch on the guitar singing some thing about the old ohio… recall that evening on the banks of the mccloud river is a lifetime memory for this fish squeezer. best to you and your family Peter. still wonder what california bull trout tastes like.. Thanks for the historical perspective on the value and use of the ESA/CESA. They are indispensable, but not sufficient, tools to conserve our ecological heritage. That requires passion, dedication, scientific objectivity and an infinite capacity for optimism – which are values you have instilled in several generations of UCD students. And, all done with wit and wry humor. As Jamie stated, working with you gave each of us memories – and skills – that have lasted. Yes, I even hold out hope that you and your colleagues will fix the Delta! A 40th year reunion? If it happens we’ll have to draw straws to see who gets to first cast the “bull trout” fly.